iOS 5 completely changes and improves the way iOS handles notifications. 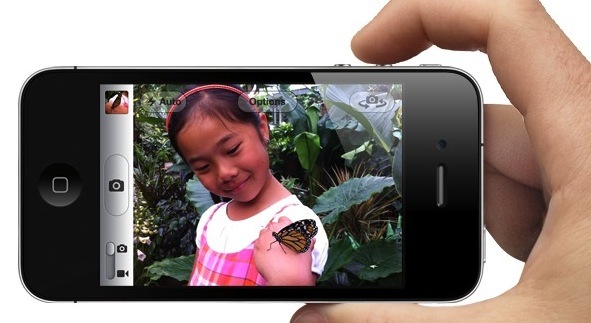 iOS 5 finally frees the iPhone, iPad, and iPod touch from syncing with a computer. iOS 5 brings a cool split keyboard for easier typing with your thumbs. Just swipe down with four fingers to reveal the split keyboard. This was one of those features that iOS needed from Windows 8 and Apple delivered quickly. 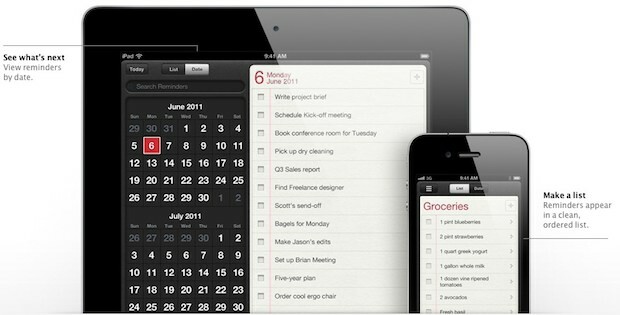 Reminders is a to-do list built into iOS 5. 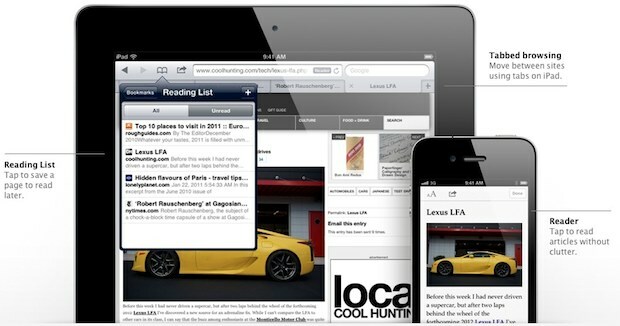 Newsstand is how iOS 5 organizes your magazine and newspaper subscriptions. There are tons of new features and improvements to iOS 5, be sure to watch this set of 9 videos of iOS 5 features in action, it’s a great look at what’s coming in the fall. Other than iCloud, this seems more iOS 4.5 to me. Is it really worthy of a whole new version? No offense to anyone but I don’t think these are that big of changes to the core OS. Where’s the file access and where’s the new multitasking manager? It doesnt really need file access seeing as how files are integrated in the apps that they work with and can be accessed by others if the devs use the right api. and now with autoback up and icloud, the files go to your computer automaticaly. as for multitasking, it seems pretty good and clean as it is now, why change something thats not broken? I agree I don’t see anything new. For me personally where are the changes to SMS tones and customization that everyone has been wanting??? I think this needs to be addressed I cannot hear SMS tones when working. That would he a worthy update along with the other changes. Looks very nice, I am excited. 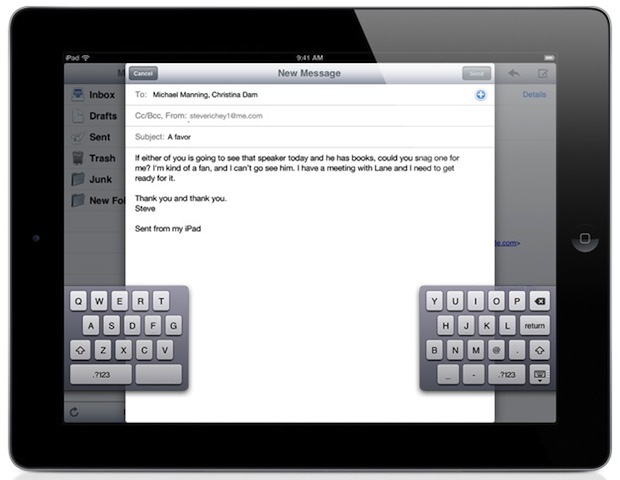 I have a feeling the split keyboard will be very popular on the iPad too, I hate typing on that thing. I don’t see what all the hype is about. In reality they have just added some of the features that have been available to jailbreakers for years…. this is why it’s good! So now everyone gets it! Most people do not jailbreak. In the Keyboard settings panel: shortcuts. Basically—TextExpander system wide. It’s freaking amazing. 1) Custom SMS Ring Tones. I would love customized sms tones as well. 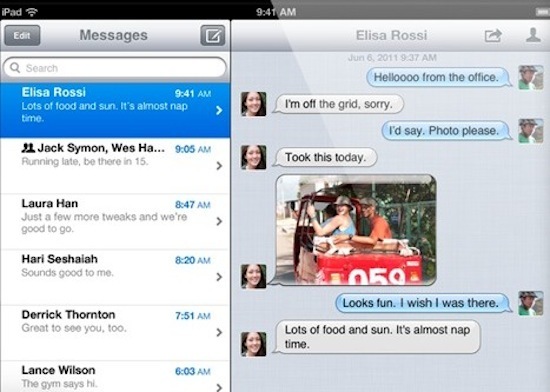 Also customizing the backround colors of messages would be nice. If I upgrade my ipod touch to the new iOS 5, will it still be able to sync to my GOOGLE CALENDAR? They say it will sync with iCal, but if only that, I wouldn’t want OS5. My ‘assumption’ is, that if they let the ipod touch 3rd gen access Gmail Calendar, then they would still allow it in OS 5. But, you never know…. Just updated myself, and beware. I can only get it to sync with one calendar from Google – I have at least 8 set up (work, a shared one with my wife, one from my son, etc. ), and this is a major loss in functionality. Also, all of my contacts are gone. You can’t sync contacts with Google anymore. That’s how I found this site, I’m trying to search the web for how to get my contacts back. i sure don’t like this compulsory newsstand business. it would be nice if you subscribed to a lot of papers, but i only subscribe to one, and that is what i want on my desktop. ALL folders should be optional. I like the feautre of “Airplay video mirroring for iPad 2 – wirelessly mirror what’s on your iPad 2 display to an Apple TV2”, then the videos I converted with iFunia for my iPad, can directly transfer to Apple TV for playing, great, just use the iPad and Apple TV to make a cool home media centre! 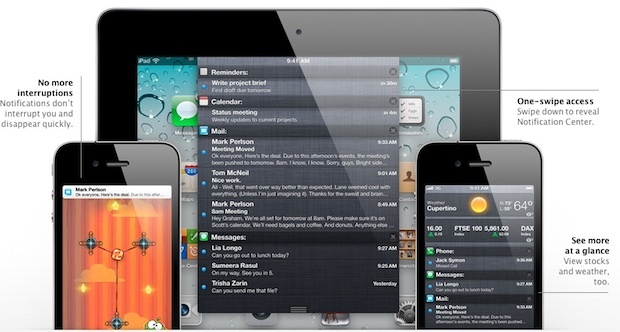 « iOS 5 Release Date: Now!